Medieval history of Switzerland was in 13th century marked by the dispute over the authority over the territory between Swiss communities and Habsburg family. On 1st August 1291 the representatives of three original cantons Uri, Schwyz and Unterwalden (today split into Obwalden and Nidwalden) met at Rütli in order to form an alliance for mutual defence against the common enemy. They took an loyalty oath (Rütlischwur) and formed the nucleus of the Swiss Confederation. Through next seven centuries, other cantons (e.g. Lucerne in 1332, Zürich in 1351, Bern in 1353, Geneva in 1860 etc. ), joined the union and formed the Switzerland we know today. Over the course of years Rütli became considered as the “birthplace of Switzerland”. In order to protect the historical site, the land forming the meadow was acquired as a private property and was later given to the government on the provision that they will preserve it in its state for the future generations. There is not much historical remains to see at Rütli, but every year for the Swiss National Holiday on the 1st of August, the re-enactments of the oath-taking takes place at Rütli to commemorate and celebrate the forming of the Old Swiss Confederacy. 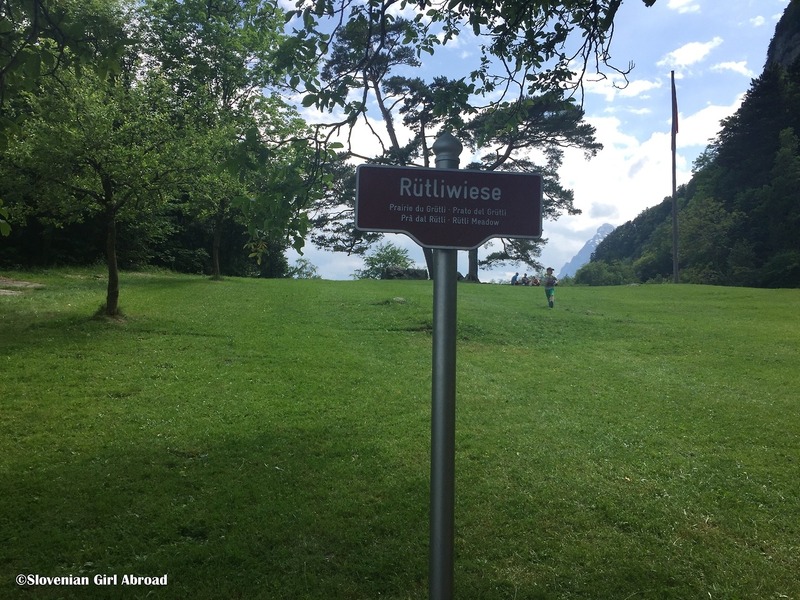 Since 1991, Rütli has also been the starting point of the Swiss Path (Weg der Schweiz) hiking trail, a 35 kilometres long hiking trail around the historic sites related to the Swiss Confederation. 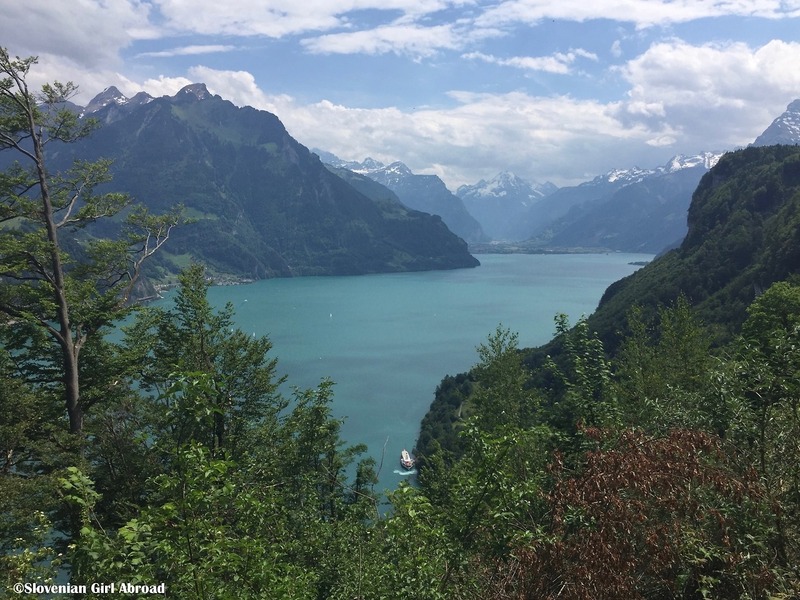 The trail begins at Rütli and leads around the Lake Uri (southern arm of the Lake Lucerne) and ends in Brunnen. 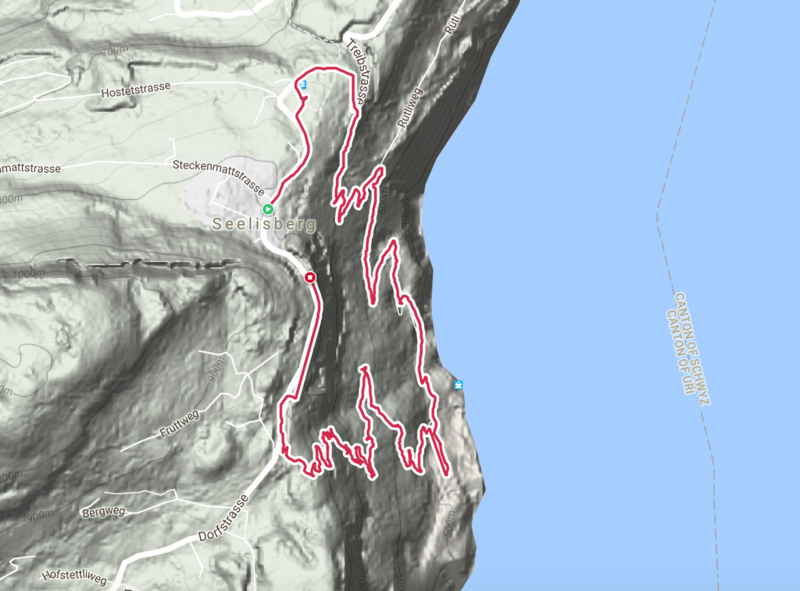 My husband and I hiked a section of that trail – a circular trail from Seelisberg to Rütli and back to Seelisberg. 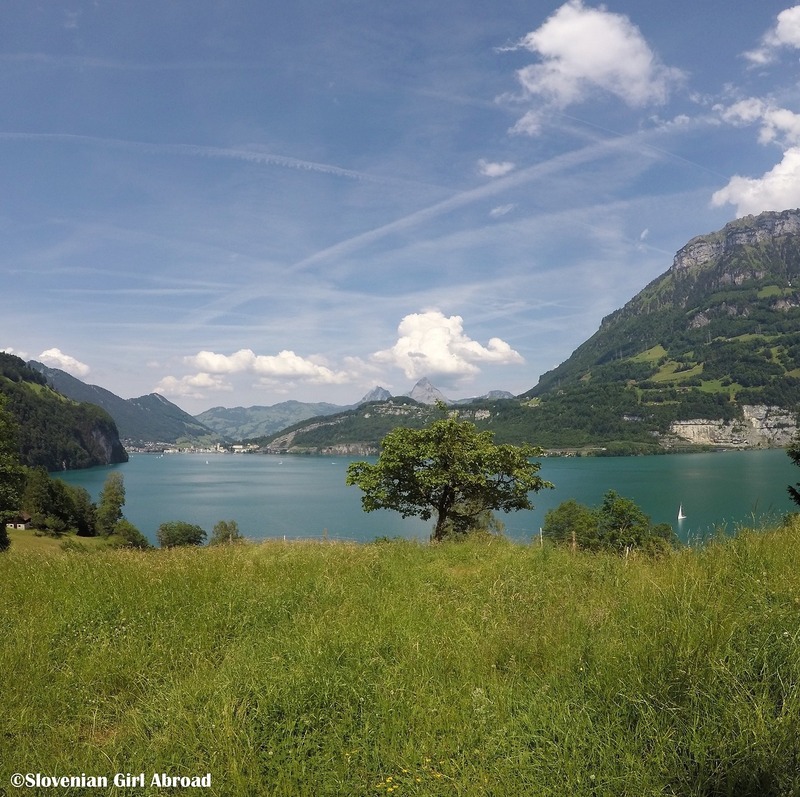 Our hike began at Seelisberg – small village high above the Lake Lucerne. After we found place to park our car, we searched for the hiking trail and start our descent to Rütli. The hike wasn’t the most scenic one I have ever done, but it offered some amazing vistas over the Urner Alps, Lake Uri, Flüelen and Brunnen on the way. In half an hour we’ve reached Rütli. Because there was wedding reception happening at the meadow, we didn’t stay long. After we’ve rested our feet we returned back to Seelisberg. We could have take the railway up, but we were in a mood for walking. It took us an hour to reach Seelisberg. We walked to our car and drove back home to Lucerne. How to get to Rütli? The Rütli can be reached only on foot from Seelisberg or by boat from Brunnen, Lucerne, Beckenried and Flülen. – By boat: Most visitors to the Rütli arrive by boat. There is a regular ferry service from Brunnen, Lucerne, Beckenried and Flülen. 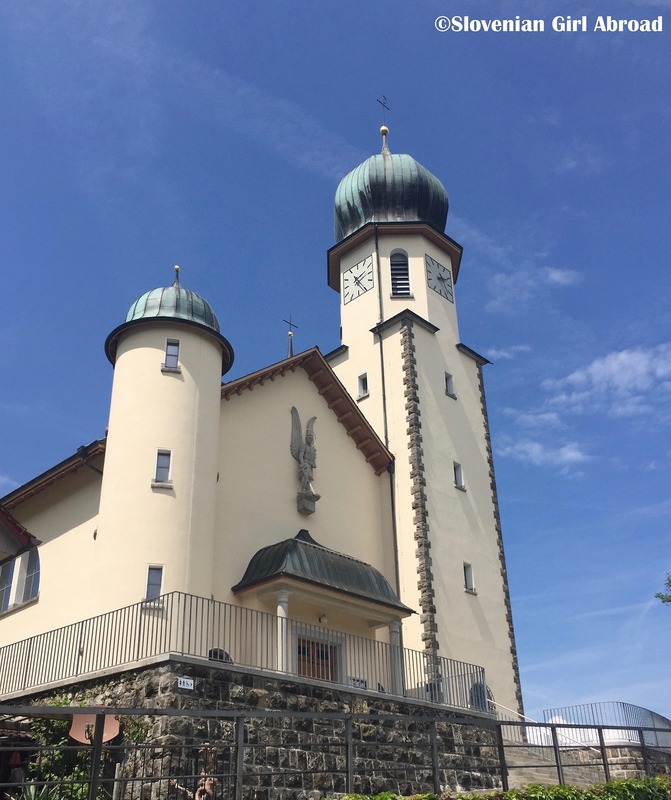 – By bus: Seelisberg can be reached by post bus no 311 from Stans. From Seelisberg you can walk or take the Treib-Seelisberg railway down to Rütli. At A2 highway take the exit no. 35 (Seelisberg/Emmetten/Beckenried) and follow the signs for Seelisberg. From Seelisberg you can walk or take the Treib-Seelisberg railway down to Rütli. That lone, giant mountain rising up from the lake is very majestic! Wow! This place is a piece of paradise! Loved the pictures! Thank you Rosemary. 🙂 Such a shame for the rain. This area is so much more magnificent with the clear skies. I hope you your trip despite the rain. Yes we had an amazing time – the weather was superb just rainy for the last couple of days and Lake Lucerne is beautiful even in the mist! What amazing scenery. 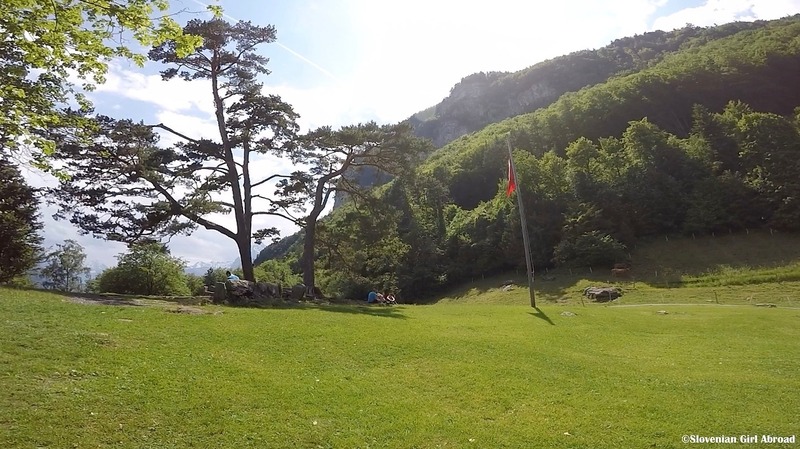 The Swiss mountains are just majestic! How interesting, too, that it’s become known as the birthplace of modern Switzerland. Thanks for joining us on #adventurecalling, I hope you can again tomorrow. 1291 – wow, Switzerland goes back a while! Lake Lucerne looks utterly stunning.